Between American Forces Under Gen. Maxwell and Col. Dayton and The British Army on Its Advance to Springfield. Four miles from Newark. The Borough of Elizabeth was incorporated February 8, 1739, and was the first English and second permanent settlement in the State. Philip Carteret, first Governor of East Jersey, landed at the Point which he named Elizabethtown in 1665, in honor of Lady Elizabeth Carteret, wife of Sir George Carteret. The Colonial Assembly met here May 26-30, 1668, and continued so to meet until 1682. In 1686 it met at Amboy, and subsequently alternated between Amboy and Burlington. December 1, 1774, Elizabethtown approved the recommendation of the Continental Congress regarding non-importation and non-exportation, and on February 13, 1775, resolved to break off trade, etc., with Staten Islanders as unfriendly "to the liberties of America." Elizabeth suffered greatly during the Revolution from Tory raids, and was the scene of four battles or engagements, viz: December, 1776, January 25-30, 1777, and June 6, 1780. Two other engagements took place at the Point July 21, 1778, and June 8, 1780. Hetfield House. Foot of Pearl Street, near Elizabeth River, supposed to have been built 1667, conveyed to Matthias Heathfield December 5, 1673. Still owned by his descendants who spell the name Hetfield. St. John's Parsonage. 633 Pearl Street. Built 1696 by Andrew Hampton. Purchased in 1749 by Trustees of St. John's Church. Williamson House. Corner of Pearl and Williamson Streets. Built in 1776. Now used by St. Elizabeth's Hospital. Home of General Matthias Williamson, Revolutionary officer, who was the father of Governor Isaac H. Williamson and grandfather of Chancellor Benjamin Williamson. The Old Chateau. 408 Rahway Avenue. Built 1760. Home of Cavalier Jouet, grandfather of Chancellor Williamson. Jouet was a descendant of Daniel Jouet of Angers, France, and Marie Cavalier, a sister of the "Camisard" Jean Cavalier, famous in the time of Louis XIV. Cavalier Jouet was a Tory and his property was confiscated. DeHart House. 101 Rahway Avenue, corner of Cherry Street. Built 1766. Home of John DeHart, member of the Continental Congress and Mayor of Elizabeth. Site of Red Lion Inn. Broad Street and Rahway Avenue. Now occupied by Public Library. Inn built about 1734. In 1764, called Marquis of Granby. In 1771 name changed to "Red Lion." General Washington on the way to his first inauguration stopped and held a reception at the Red Lion. Boudinot Mansion or Boxwood Hall. 1073 E. Jersey Street. Probably built about 1750. Home during Revolution of Elias Boudinot, who, as President of the Continental Congress, signed the treaty of peace with Great Britain. The body of Rev. James Caldwell, murdered by the British at Elizabethtown Point, was exposed to the view of the Revolutionary Army on the steps of this house and Boudinot made an address. 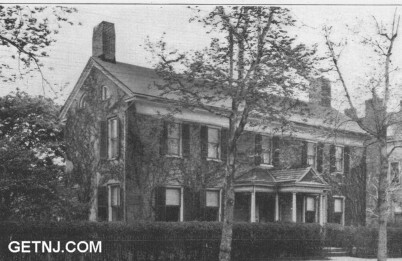 Home owned subsequently by Jonathan Dayton, Speaker of the United States House of Representatives and United States Senator, for whom Dayton, Ohio was named. Lafayette entertained here in 1824. Now "Home for Aged Women." Marked by bronze tablet placed by the Boudinot Chapter, D.A.R., 1899. Carteret Arms. 16 S. Broad Street. Used as a tavern prior to 1728. Resort of British officers. Purchased in 1913 by the Elizabeth Historic and Civic Association, now occupied by the Woman's Club. Graham's Tavern. Northeast corner Broad and Jersey Streets, also known as City Tavern. Noted for the prominent persons who patronized it, including Dr. Barnet, Lord Stirling, Judge Chetwood, Matthias Williamson, and others. General Scott House. 1105 E. Jersey Street. Home of Dr. William Barnet, Revolutionary Surgeon, built 1763. Plundered by the British in 1781. Later owned by Colonel John Mayo of Richmond, Virginia, whose daughter became wife of Lieutenant General Winfield Scott. St. John's Church. Broad Street. Organized by Rev. John Brooke, cornerstone laid June 24, 1706. Incorporated by Royal Charter 1762. 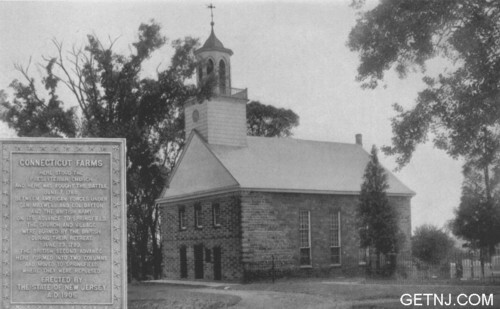 Present church erected 1859. Font presented by Cavalier Jouet. Rev. Thos. Bradbury Chandler, Revolutionary rector, was a Loyalist and fled to England. Church used as a stable by British, who tried to burn it. Nathaniel Bonnell House. 1045 E. Jersey Street. Built before 1682. Reputed to be the second oldest house in Elizabeth. Minute Man erected Union Square, marking site of Continental Outpost at battle of June 8, 1780. Governor Belcher Mansion. 1046 E. Jersey Street. On original lot of John Ogden, one of first settlers. Governor Belcher lived here from 1751 to 1757, entertaining many prominent persons including George Whitefield and Jonathan Edwards. House has been called "the cradle of Princeton University." Residence of William Peartree Smith, Revolutionary Patriot, later residence of Governor Aaron Ogden, who entertained Lafayette here in 1824. Marked in 1925 by bronze tablet placed by Daughters of the Founders and Patriots of America. Site of Gracie House. 1123 Elizabeth Avenue. Bought in 1764 by Captain Isaac Lawrence from Jonathan Hampton and Elias Dayton, later owned by Jonathan Dayton and Elias Boudinot, who conveyed it to Dr. Abraham Clark, son of a signer of the Declaration of Independence. Old Fort. Thompson's Avenue near Bridge Street. House built by Captain John Hunlake, bears date 1734. First Presbyterian Church. Broad Street. Organized 1664. Burned 1780. Rebuilt 1784. The Revolutionary Pastor, Rev. James Caldwell, a strong patriot, was shot at Elizabethtown Point while under a flag of truce. Site of Second Government House built 1680 by Governor Carteret. Across the alley, west of Penal's store at 1150 Elizabeth Avenue, half way between the Avenue and the Creek. Advertised in 1785 as "that large commodious famous brick house built***** by a former Governor of New Jersey for the seat of government. Situated on the river running through the town, on which is a very good wharf." Liberty Hall. Morris Avenue. Built in 1772 by William Livingston, Revolutionary Governor of New Jersey. Scene of the marriage of Governor Livingston's daughter to John Jay, first Chief Justice of the United States Supreme Court. William Henry Harrison, ninth President of the United States, eloped from this house with a granddaughter of Livingston, the daughter of Susannah Livingston and John Cleves Symmes. 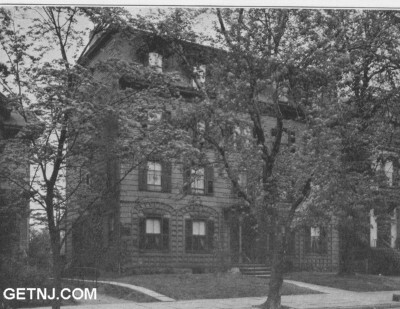 House later owned by Lord Bolingbrook and Susan Livingston Kean, great-grandmother of United States Senator Kean of New Jersey. Near Newark. Scene of battle June 7, 1780, between six thousand British, including Coldstream Guards and Germans, and Americans under Gen eral Maxwell, resulting in defeat and retreat of British. Home of Rev. James Caldwell, minister of the First Presbyterian Church of Elizabethtown. June 25, 1780, Mrs. Caldwell was shot at Connecticut Farms by a Tory. The town was destroyed November 24, 1781. Tablet erected by State to Mrs. Caldwell. Supposed to have derived its first name from an Indian Chief named Radwack. The first dwellings were built about 1720. Abraham Clark, One of the signers of the Declaration Of Independence, was born about one and one-half miles from Rahway on the road to Elizabeth. Though not a lawyer, he was known as the "Poor man's Counselor." Died June 1794 and buried in Presbyterian Cemetery at Rahway. On turnpike from Elizabeth to Morristown. Six miles from Morristown at the foot of Short Hills. Town founded about 1717 when the Briant family came to Springfield from Hackensack. Springfield was the site of a bitterly contested engagement between the Continentals and Militia under the command of Major Generals Green and Dickinson and the British, June 23, 1780. The British forced the passage to the streams protecting the town and burned it. During the battle "Parson" Caldwell took hymn books from the church and threw them to the soldiers for wadding, shouting "Put Watts into 'em, boys." Battle commemorated in Bret Harte's poem "Caldwell of Springfield," and by monument erected by Sons of American Revolution. Originally of Quaker origin. Quaker Meeting House built 1788 at Watchung and North Avenue, still standing. Monument in Green Brook Park, Plainfield, commemorating camp at Blue Hills. Near Plainfield. Point from which General Washington, in May and June 1777, watched New York Harbor to ascertain the direction in which the British Army, under Lord Howe, sailed. Marked by Continental Chapter, D.A.R., 1912. Site created a park by the Legislature, 1913. Washington's Rock Park Lodge contains antique furniture given by the Continental Chapter, D.A.R.